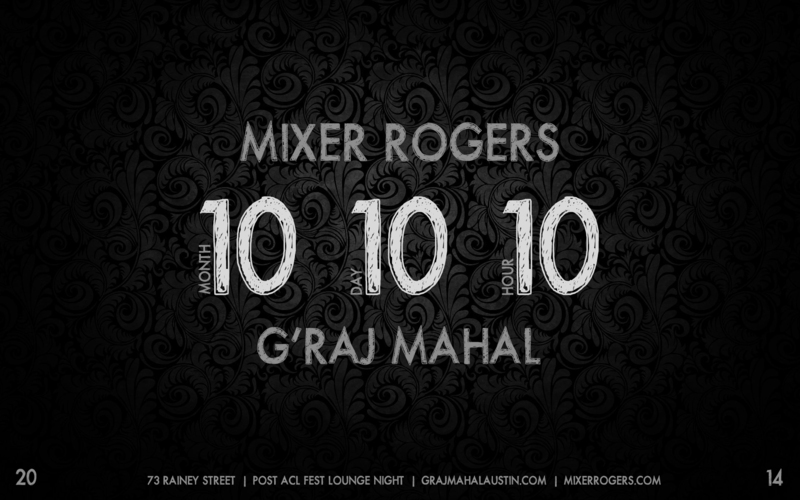 I will be spinning an eclectic set on Friday Oct 10th at G’Raj Mahal at 73 Rainey Street. If you’ve never been, this is a good opportunity. It is without a doubt, the best Indian food I have had in Austin. Not to mention the amazing atmosphere. I am so stoked to be playing there. I’m going to lean towards the old stuff: lo-fi, funky blues, old soul, indian music, etc. This night in particular is a Post ACL Fest Lounge Night. So whether you were at the festival or not, this is the after party you want to attend. I’ll go on at 10pm and keep the vibe going until midnight. Bring the crew. This entry was posted in Shows and tagged ACL, acl fest, ATX, Austin, Cam, DJ, graj mahal, indian, lounge, Mixer, Music, naan, Party, post, rainey, Rogers. Bookmark the permalink.